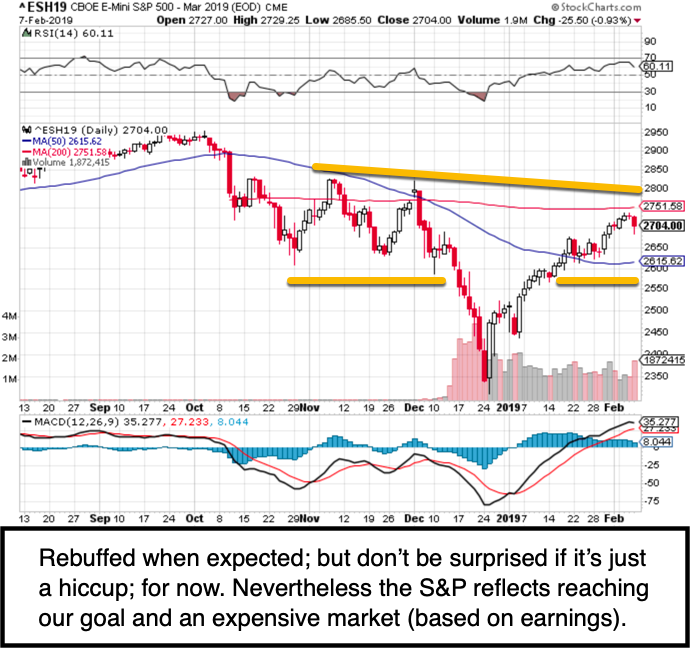 Running into a brick wall of resistance in early February, the S&P spent a few days probing the 200-Day Moving Average, after ‘nudging-above’ the target zone we establish for this market (from the forecast S&P 2300-2400 lows; to the 2600-2700 resistance area, which I termed a ‘congestion zone’) all the way back in Christmas week. Throughout January I suggested that ideally the S&P (and even better for Nasdaq) would nudge higher into this area, and probe above S&P 2700; but not reach 2800, at least not on this phase. 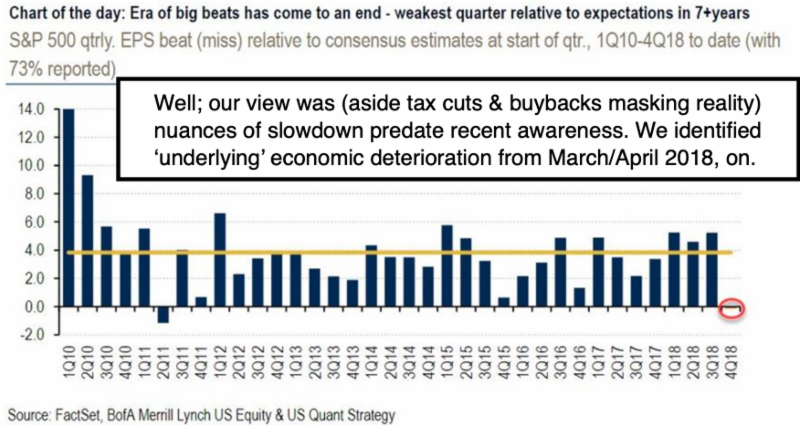 Last year I warned investors of the dangers of buybacks (providing primarily a form of additional executive compensation for insiders who were selling at record rates); of passive investing taking investors eyes off of actual stocks; and the concentration in Index trading, ETF’s and algorithmic system styles, which actually detract from an investor (or analyst) being up-to-speed on the actual workings of the economy or individual stocks. 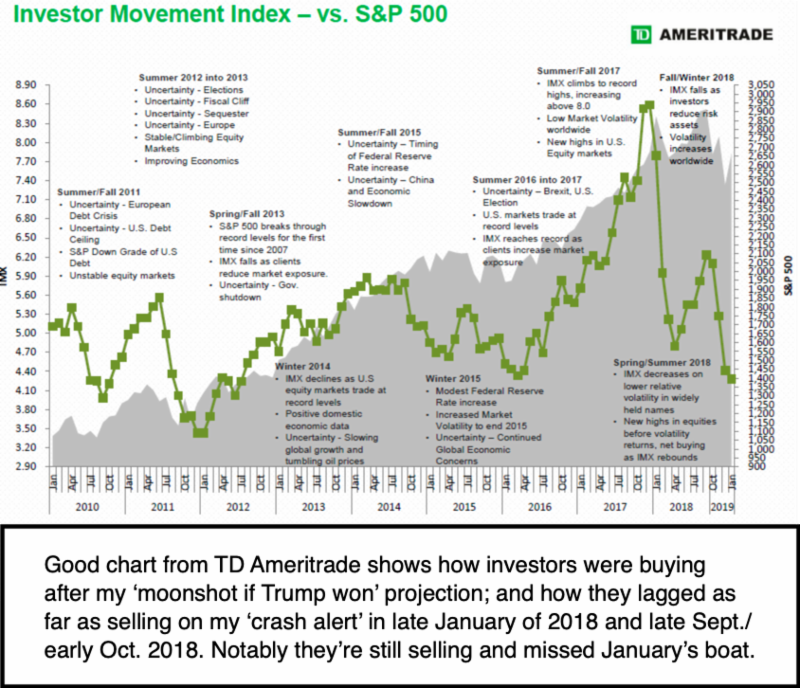 Recently there has been more understanding of impacts from approaches of this type; however it’s coming ‘after’ the forecast drubbing during 2018 most managers suffered, for failing to use ‘analytical logic’ to recognize what from my view (as you know) as a blow-off cyclical top in late January of 2018. My viewpoint was that we would have a break; and a series of alternating (a term ‘rinse & repeat’ was used) moves, with ‘sell the rallies’ being operative as a tactic for serious investors to build liquidity and prepare for better entry spots later-on. We particularly identified FANG-type stocks as overpriced. This matters; because we indicated a 2nd ‘crash alert’ at September’s end, and on October 2nd called for a break ‘then’. Got it; and stayed bearish for the unwinding until the first ‘scaling-back-in’ (nibbling not noshing) into what I called an ‘orthodox liquidation phase’ finally appearing just ahead of what was not just Christmas Eve’s low; but as stocks would start settling in 2019. That is concerning as outlined last night; usually suggests an eventual capitulation to the upside (less likely), or perhaps a greater-than-minor setback (and here again what happens with China matters a lot). Bottom line: we got our January rally nudging-up into February and a short term (at least) high concurrent with the early February ‘nudge’ slightly over the targeted upside ‘congestion zone’.